The Latino Business Awards has become LA's premiere Latino event showcasing a wide array of successful entrepreneurs that have earned the recognition for their hard work, entrepreneurial spirit and their contributions to the LA economy. 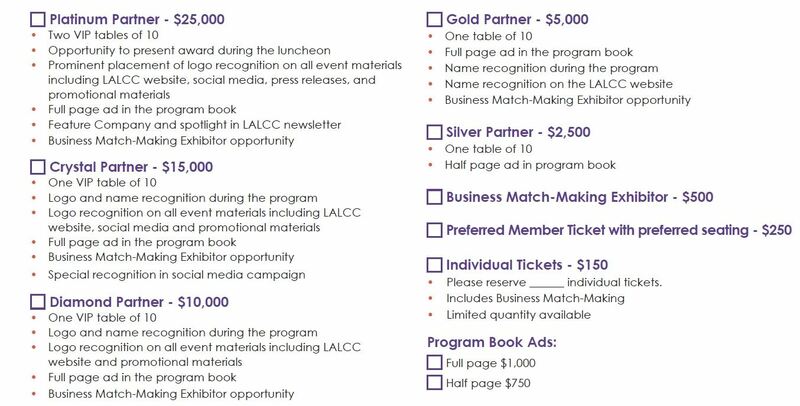 In order to be included in Latino Business Awards Program Book, please confirm sponsorship by June 20th. "A leader who is using technology to disrupt longstanding norms and create new markets of possibility"
"A new-to-market leader who has quickly captured our attention by showing promise for greatness, uniqueness, and impact"
"A leader who has played a key role in leveraging their corporate position to accelerate Latino business success"
Legacy Award: Dorene Dominguez, Vanir Group of Companies, Inc.
"A leader who is at the helm of a successful business organization whose impact has crossed over multi-generations"